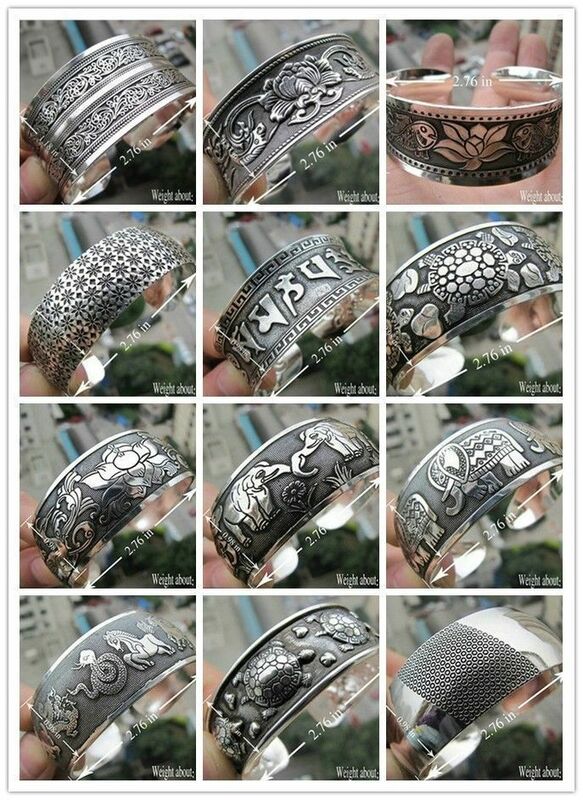 Originally I just wanted a Tibetan silver cuff bracelet, and found some on Ebay for only $1! What a steal I thought, and bought one. 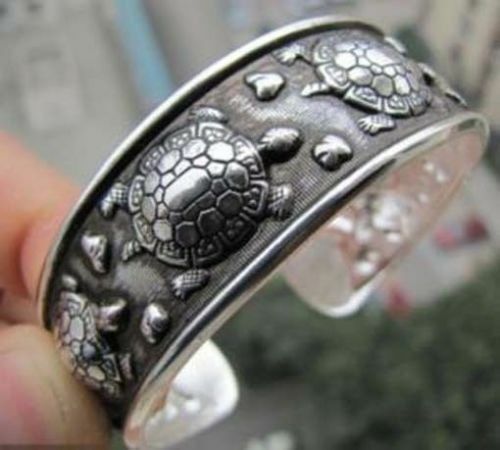 But when it arrived it was not quite round and bent so it was very, very small- just perfect for a small Tibetan woman who might have typically worn this type of bracelet, but for my European/Neanderthal self- even at only 5’6″ and a woman, I would have had to bend it outward to get it to fit. I looked closer and it even had more wear of the graphics on one side of it, where it might have rubbed against their side more often, and the only conclusion I could make is that it had been worn before. 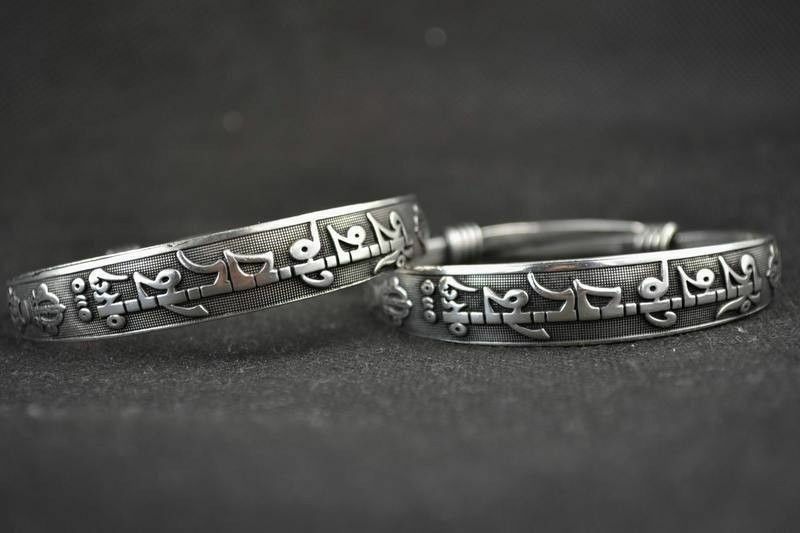 Since then I’ve amassed a collection of these Tibetan cuff bracelets- only two out of over 20 could even be considered to be new. 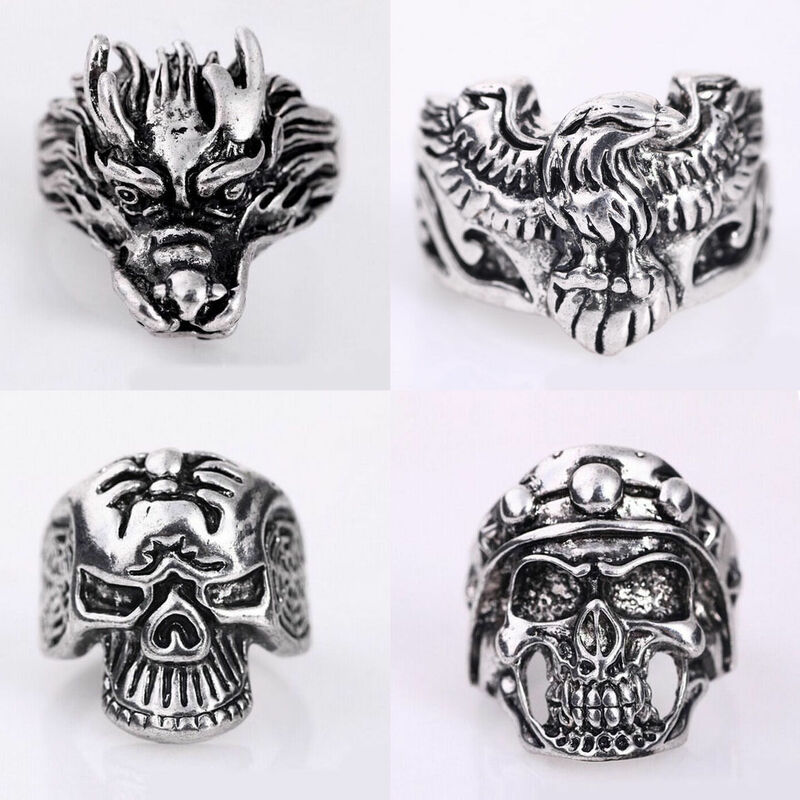 When I asked about why the bracelets were used, sellers kept reassuring me they are new, and one even told me they were making them in his factory right now in Beijing. 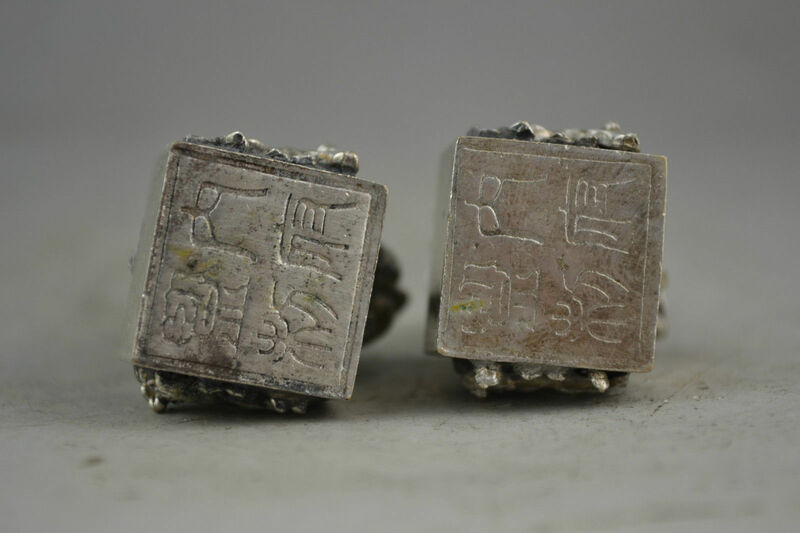 That many cuff bracelets previously owned by an oppressed minority don’t just show up on the internet being sold as new for a dollar without a reason. Like genocide. Its called murder and robbery and it has been going on for years apparently, the 10,000 bracelets listed above is just the tip of the iceberg, and still doesn’t even list all the Tibetan/Miao bracelets currently for sale on Ebay, let alone all that have been sold. 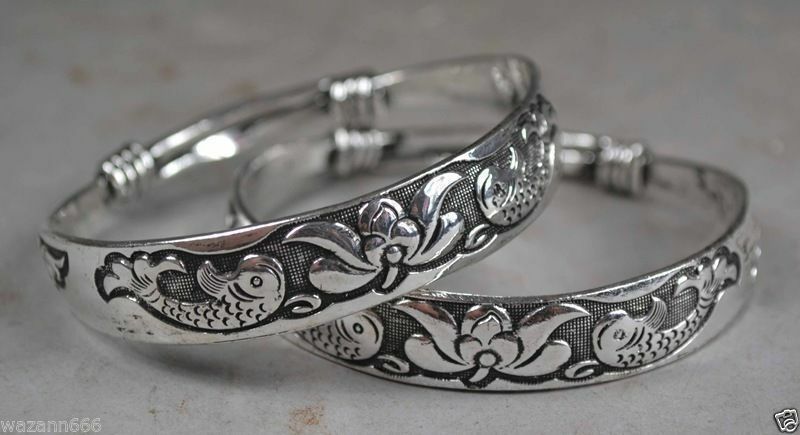 Manjushri adorns this cuff bracelet. 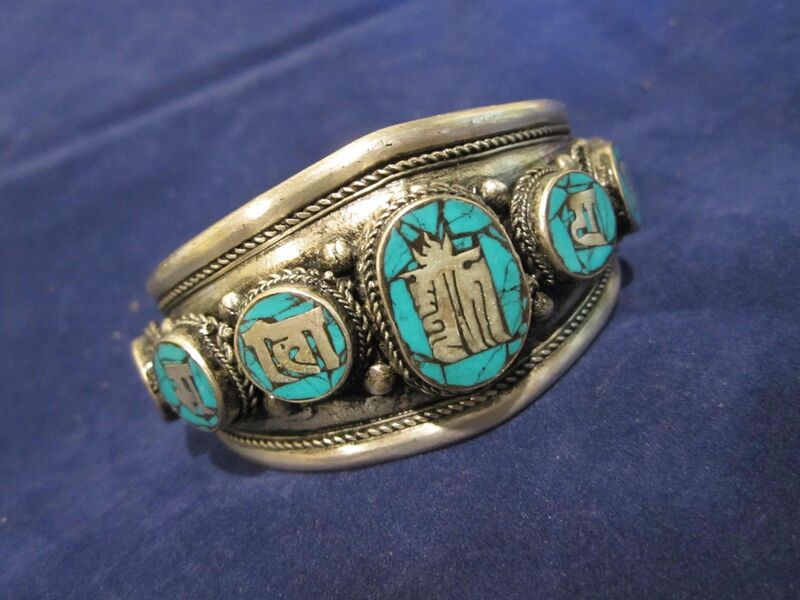 The black on this cuff is very old dirt and patina that they weren’t able to polish away. 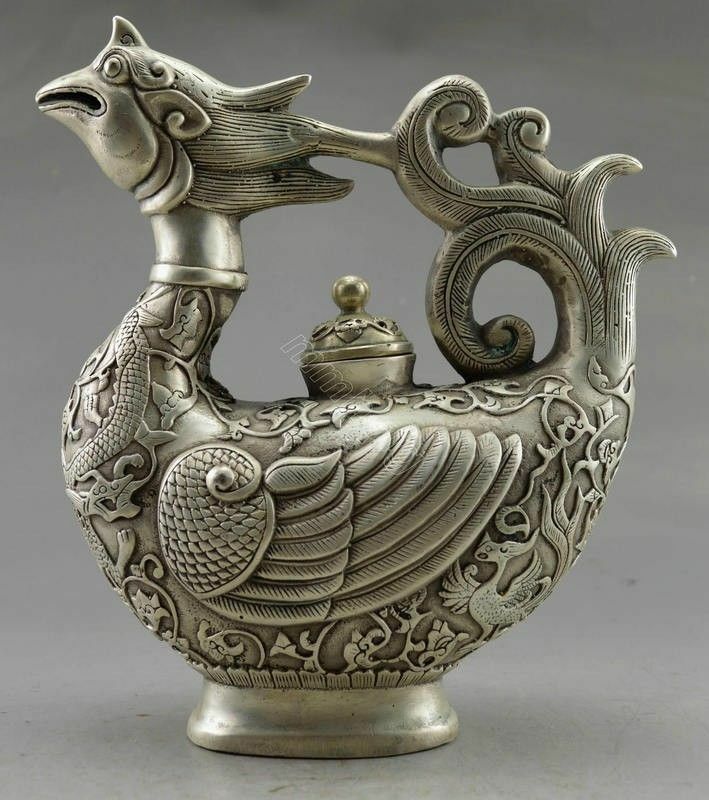 As the Chinese have moved into Tibet and the people have become assimilated- new, cheaper made products hawked by Chinese dealers have become the norm to wear, not something like antique made of turquoise resin, coral and Tibetan silver which would probably be illegal to make without government approval because Manjushri was involved. 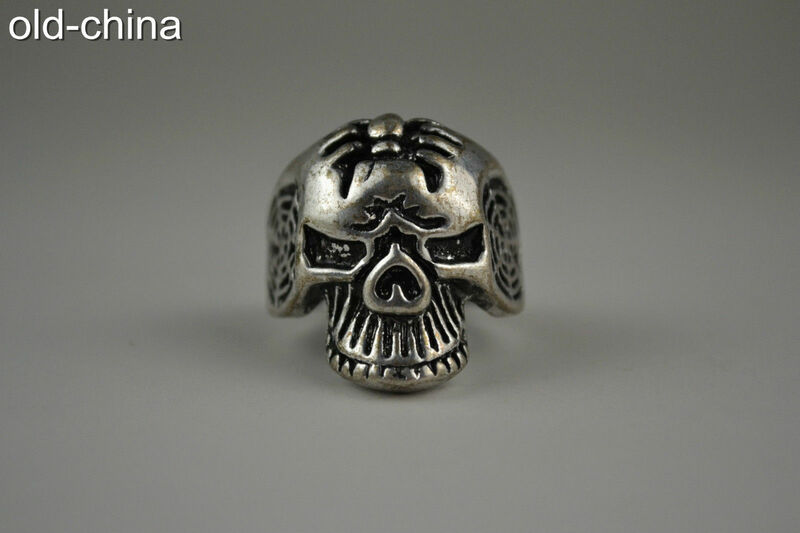 Though this exact same skull ring is often sold as “new without tags” it is a used antique. 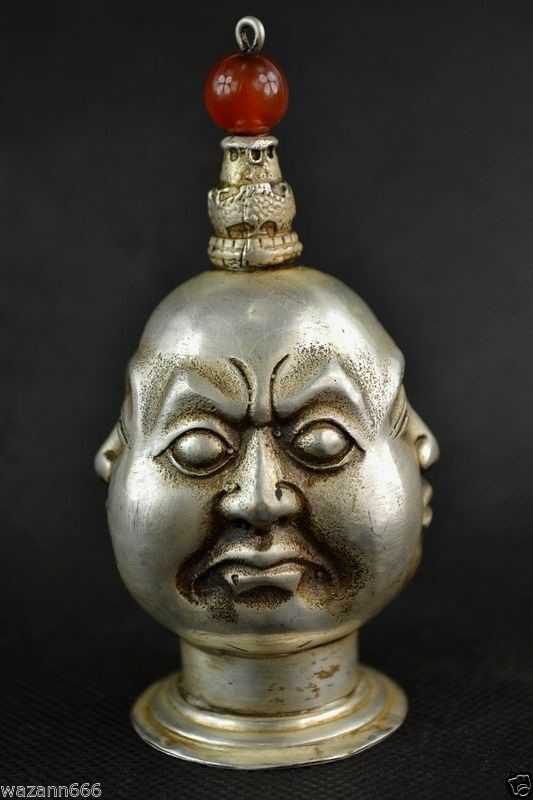 The spider on the head- though very goth and Halloween like- is a classic Buddhist symbol as well as the “earphones” the skull seems to be wearing, which are actually spider’s webs. 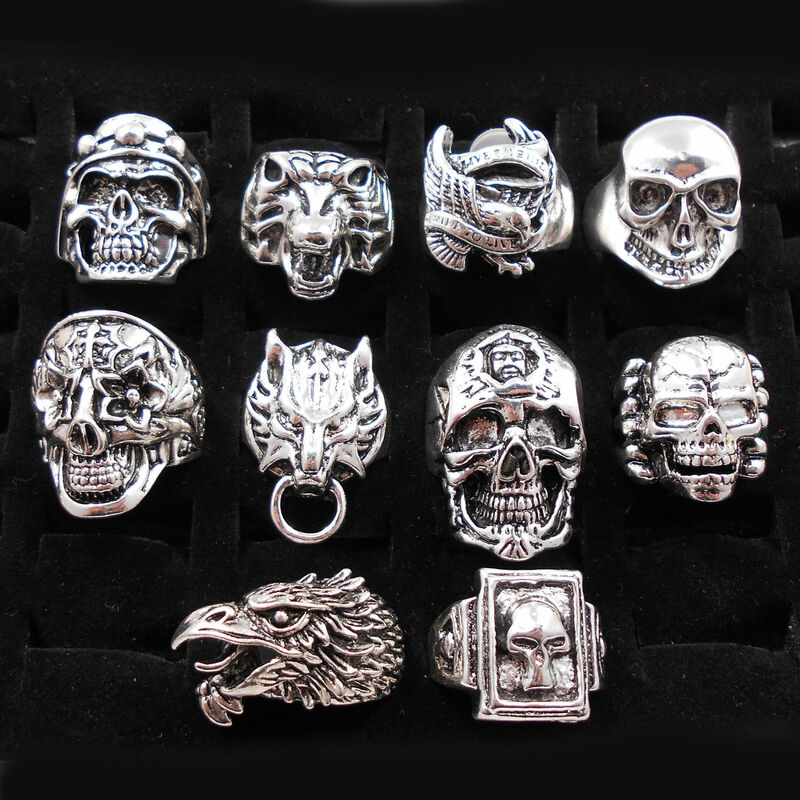 The same skull ring as above can be seen again in the lower left of this group auction of rings. 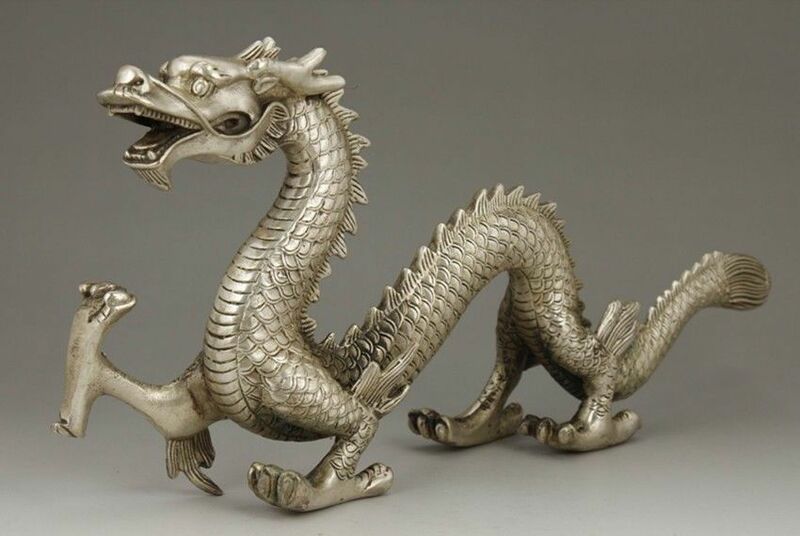 The dragon head is a classic Tibetan design, 100’s of years old or more, while the eagle- like in America- is regarded as a symbol of strength and freedom and reappears in their art again and again. 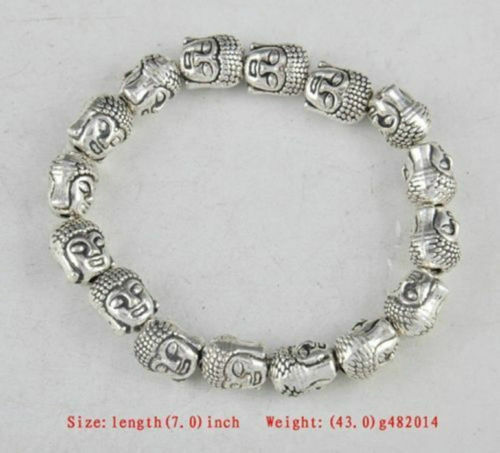 Thousands of necklaces are also being sold with these same Buddha head beads. 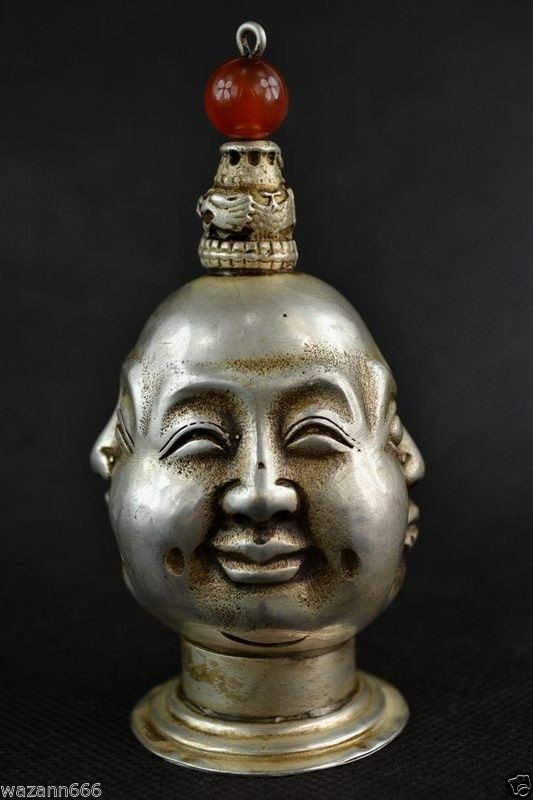 Laughing Buddha or Budai is seen above while below is Sakyamuni Buddha. 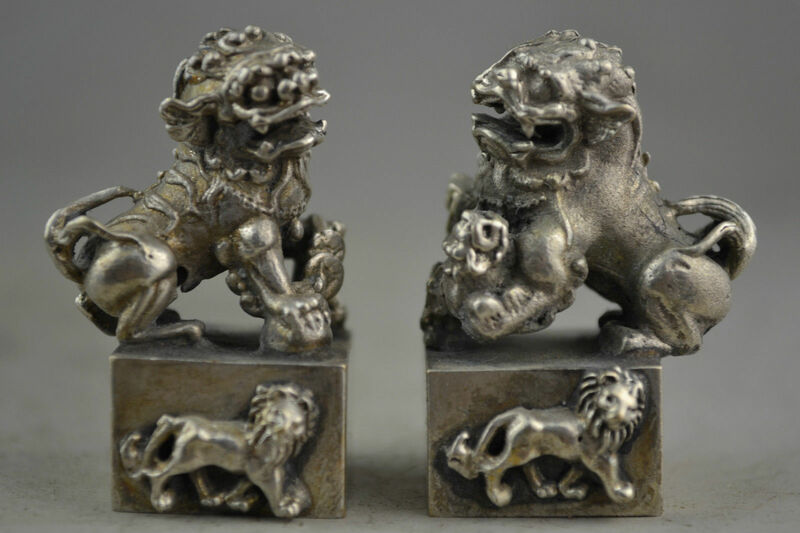 Snuff bottles, were also confiscated en masse from people- many were of high style and fine craftsmanship, and are now being sold en masse. 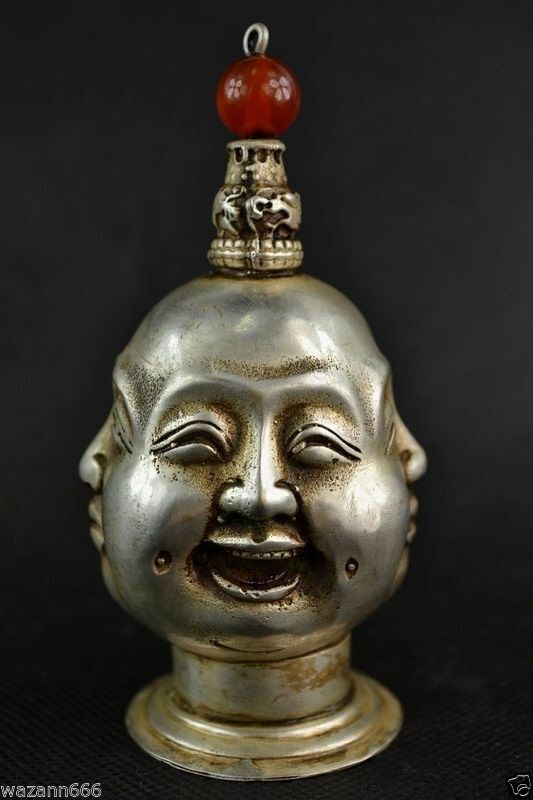 Depictions of 4 of Buddha’s different emotional states were once popular for all sorts of items including snuff bottles. 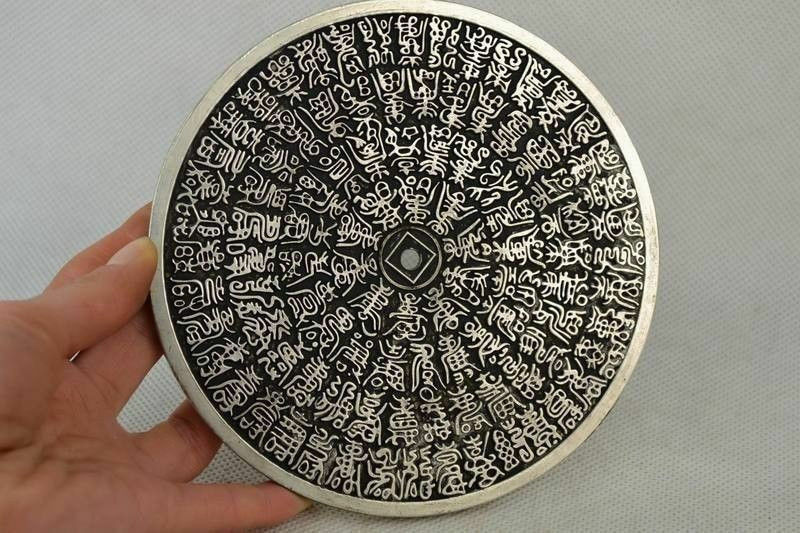 Tibetans, Buddhists and Chinese weren’t the only ones to be completely disenfranchised, Maio silver (Hmong) as well as the embroidery they are known for is found in great numbers as well on Ebay, for extremely cheap, as well as other minorities such as Uyghurs who have long been persecuted. And then there’s a plethora of pipes on sale to go with the snuff bottles. Just a funny thing to think about after the Chinese hating drugs for so long. 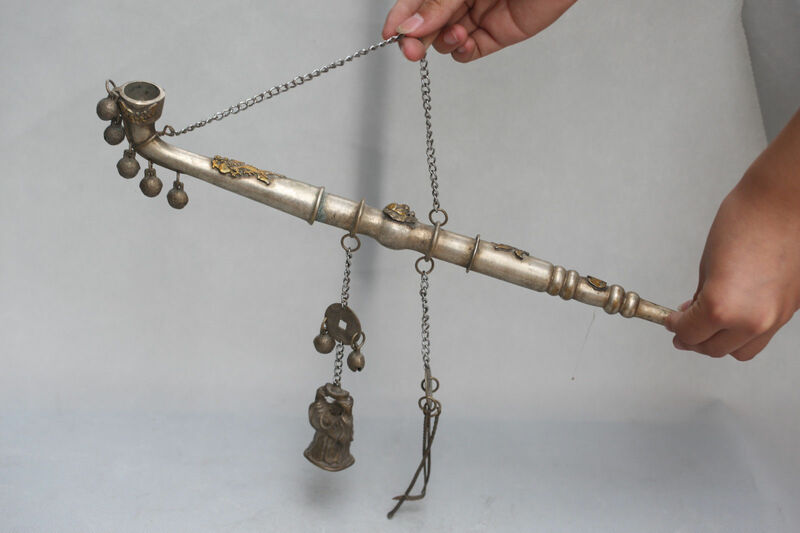 What would happen if our police departments all busted out the bongs (ahem, excuse me, “water pipes”) they’ve collected over the years and auctioned them to the public on Ebay? 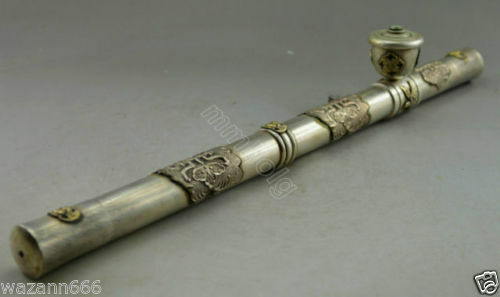 The vast majority of the pipes listed on Ebay are all old enough to be from the great push in the 1950’s and 60’s, where in 1959 where at least 80,000 Tibetans were killed in Lhasa alone. 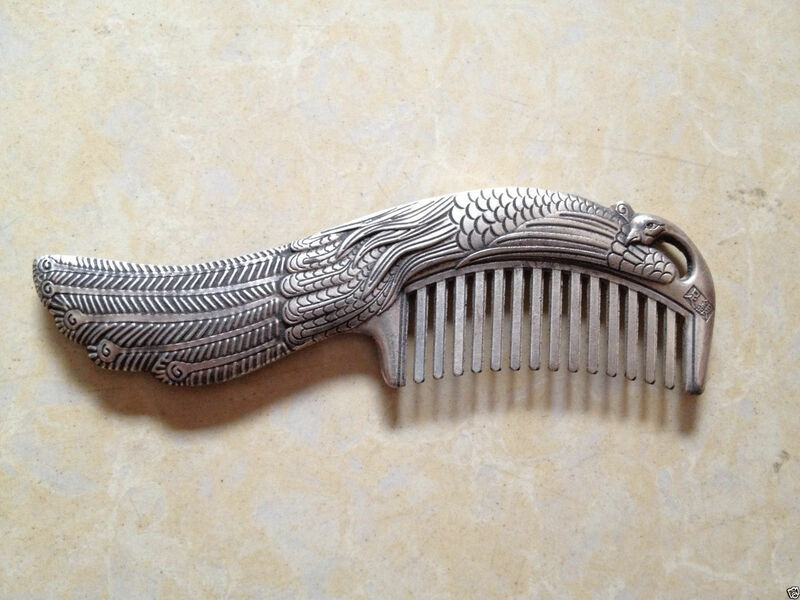 Personal items like combs and hair pins were fair game for Communist confiscations as well as the opium paraphernalia. 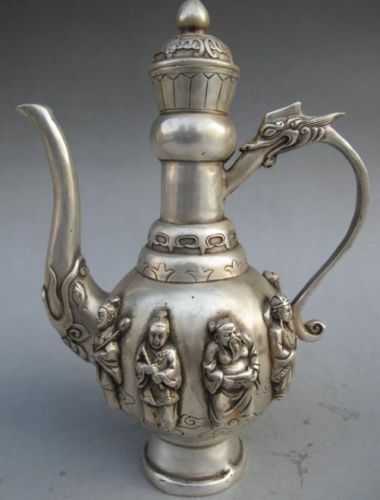 Again many of these items are Maio silver, not only Tibetan. 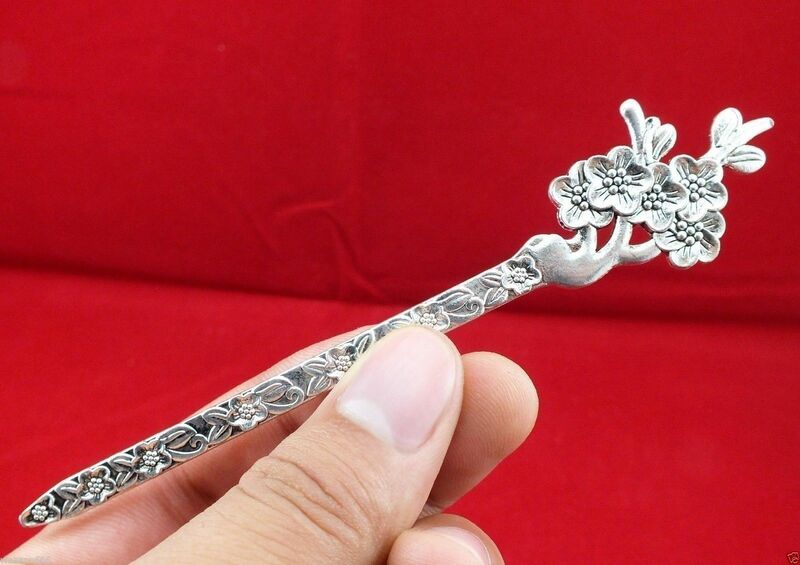 Fox hair pin. They symbol of craftiness, slyness and high intellect, foxes are revered. 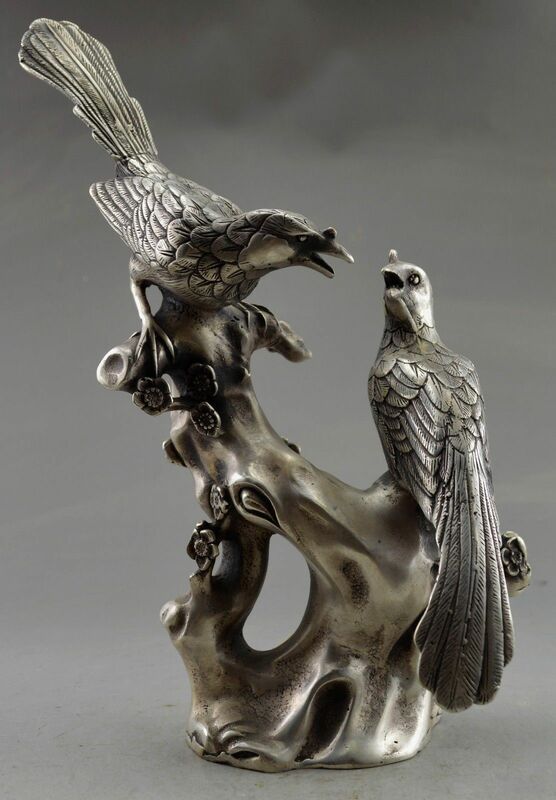 The fox symbolizes the Tibetan woman, the man is the wolf. 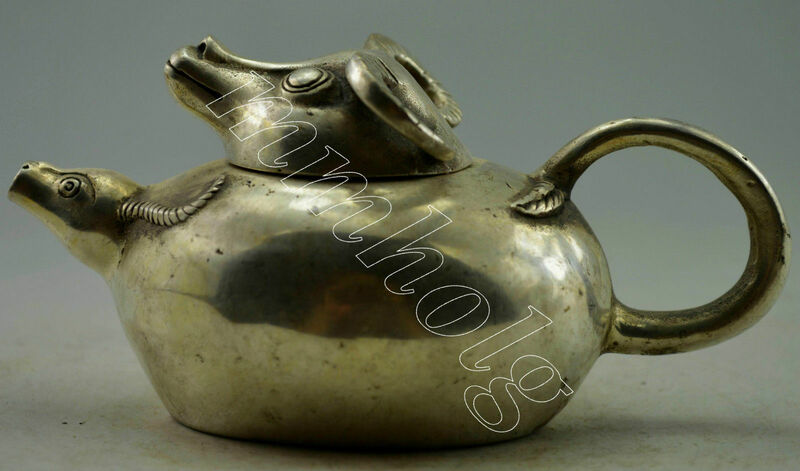 Because the same exact photos, a series of them, are used again and again to sell the exact same item, I would assume that it is government ran- and whomever supplies the items, also supplies photos of the items to the sellers. 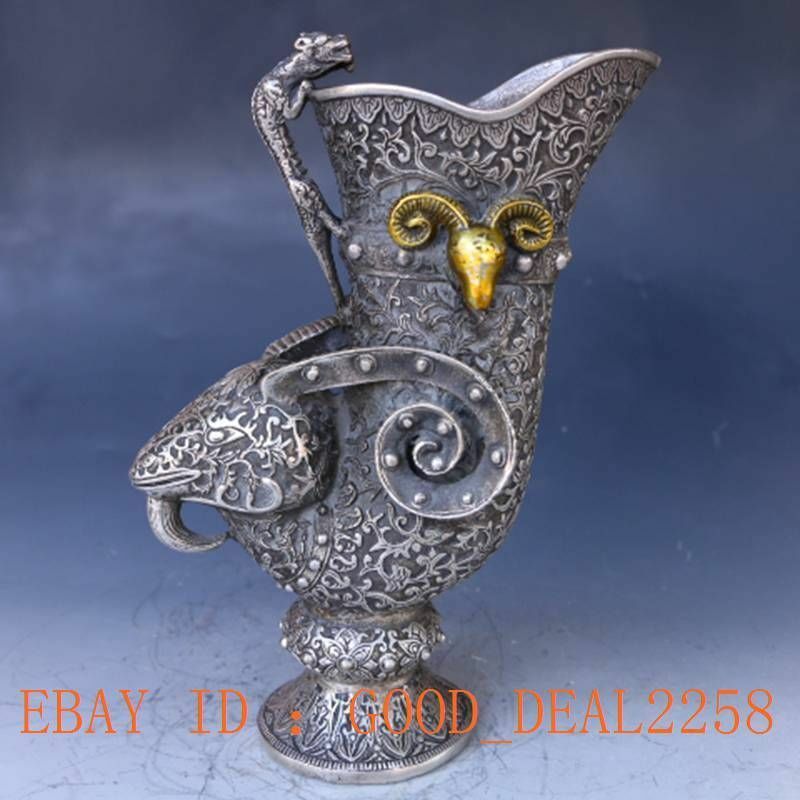 What it really worrysome here is the sheer numbers- of which the links above are only a small fraction of the numbers currently for sale on Ebay of just this item, but there are often called “new” as well. 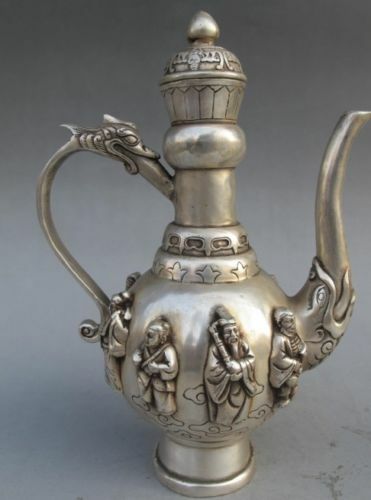 If it was all for sale as antiques, it might be fine, but sellers repeatedly lie about previous ownership and cover it up and this is very, very suspicious behavior. 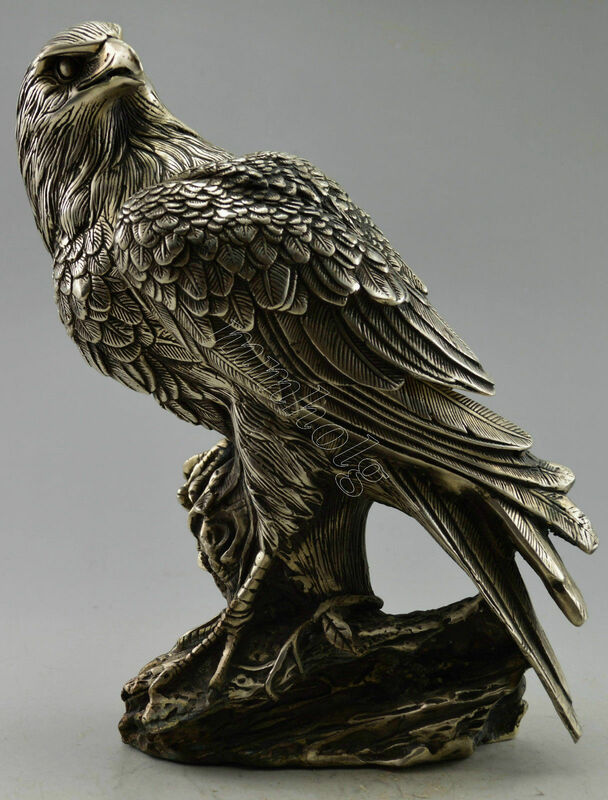 The old patina and scratches can clearly be seen in the photos taken by them, reproduced and distributed by them, yet they are allowed to continue lying and no one besides me apparently says a thing. 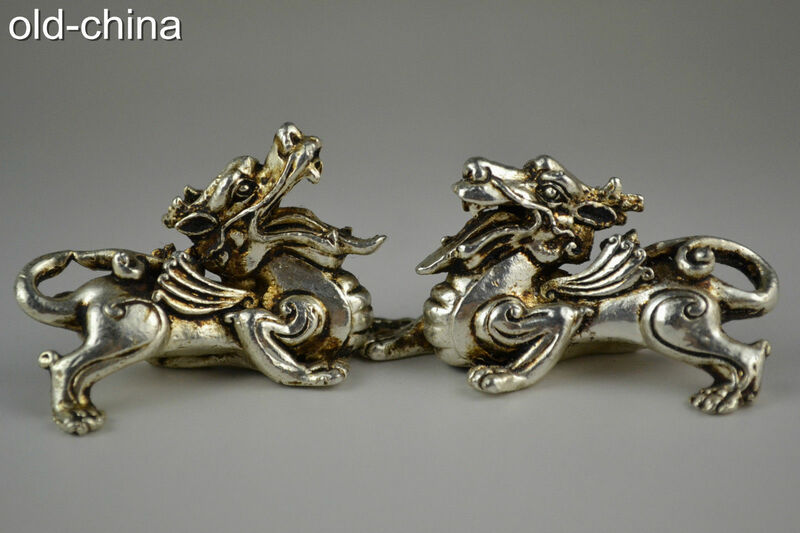 This is where so many of the hair pins come from as well as lockets and other items. Though each item doesn’t seem like much, if you rob one lady of their entire outfit and sell it piece by piece, then each amounts to at least $100 if not more- bell by bell by bell, scrap of embroidered cloth by scrap- there is nothing too small to try to make a buck off of. 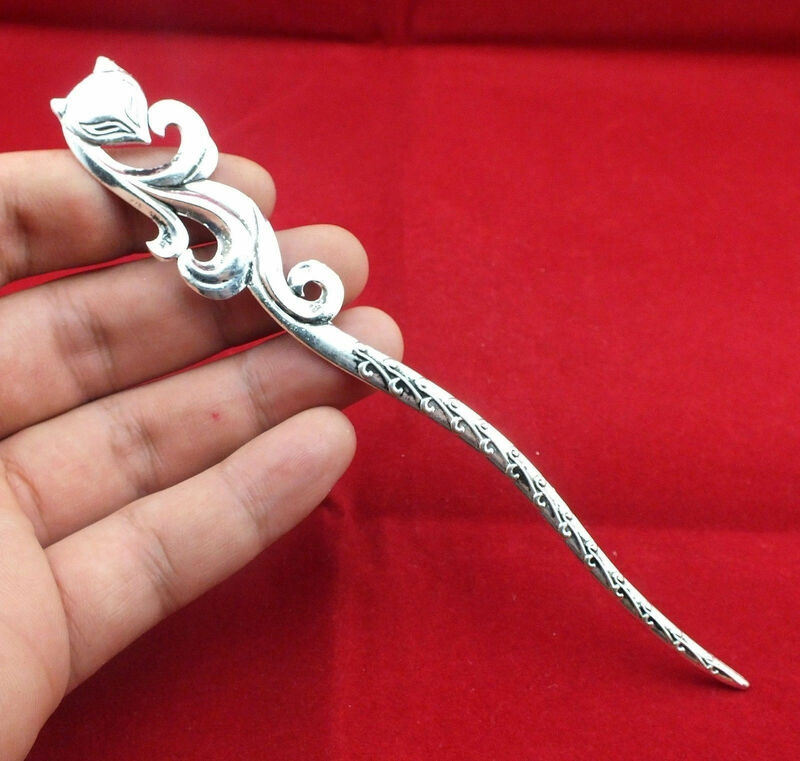 Sadly I was unable to find any pictures of ladies wearing the exact models of hairpins that are for sale in such vast quantities on Ebay. They went extinct? 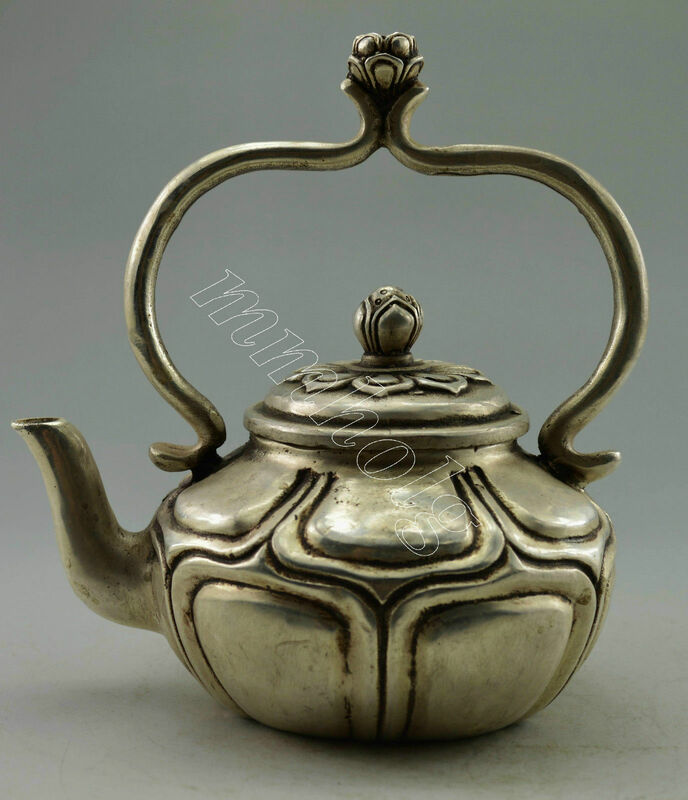 Tea pots were extremely popular and actually useful, unlike some other metal and porcelain items. 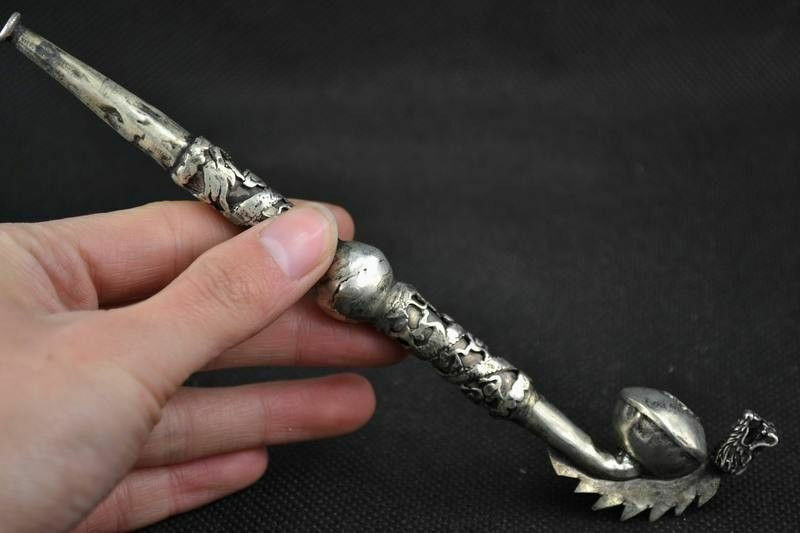 ….And the sales of the exact same antique items- from the mundane like plain ox horn hair brushes to rare treasures and great art- go on and on. 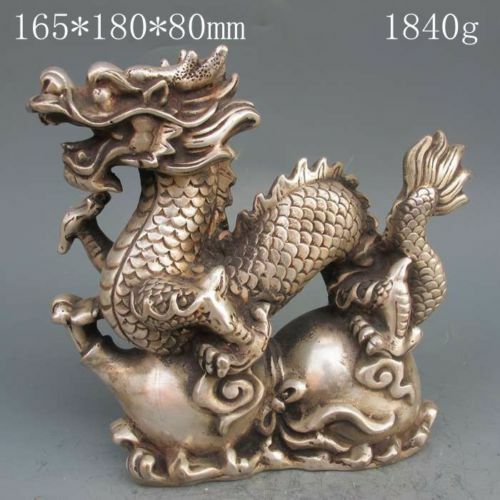 As an antique dealer’s daughter, I’ve never seen the numbers of exact same items that we are seeing here. Part of the reason that it is going so cheaply is because of those sheer numbers, but it is an unnatural situation, a “flood” of biblical proportions has occurred. The equivalent is if we were to gather up all the Wedgwood pottery, or Tiffany lampshades that had ever been created and perhaps disperse 20% of it back to America, then sell the other 80% of America’s artistic heritage on Ebay for 1/4 of the value or less. And if we did that in every single category of item America has produced since the stone ages that was worth saving, we would be living the equivalent of what China has done to its own country and people. Sad days for art and culture, to be so cheaply prostituted after being stolen from so many individuals and families. This type of design- ovals with graduating lines is quite similar to what I would call a “feather form” or one also used for fins and flippers by the NW Coast Indians. Fascinated that it has been used to portray a lotus here. 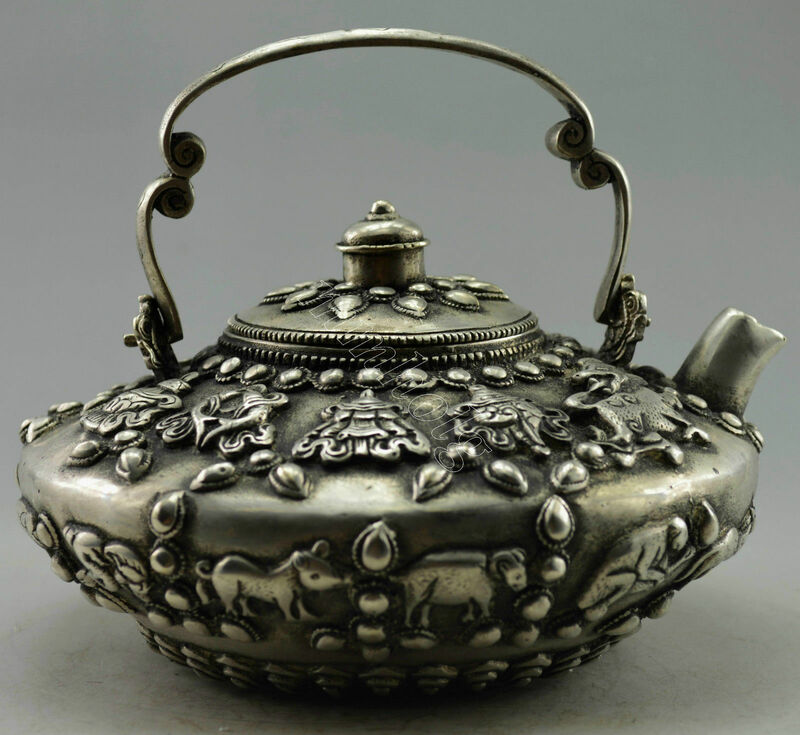 Not only do these tea pots have the eight auspicious Buddhist symbols, but the 12 zodiac animals encircle the lower half as well. Very auspicious! 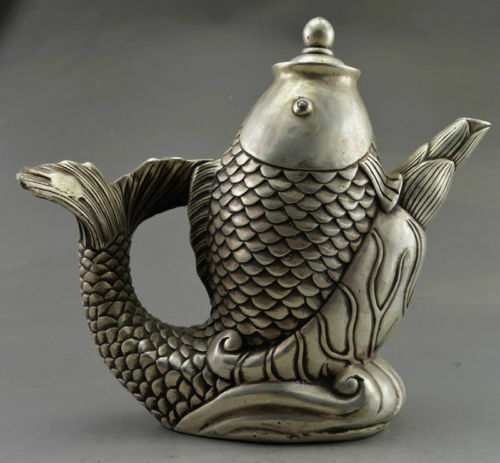 Probably the 2nd most common metal container next to teapots are incense burners. 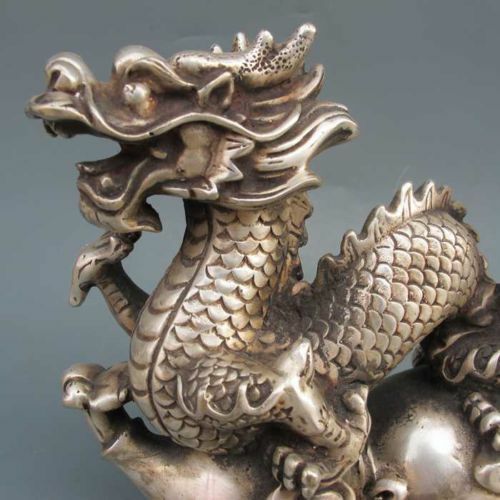 From the beginning of when metal first was created until now, they were part of everyday life as well as used in rituals, ceremonies and shrines. 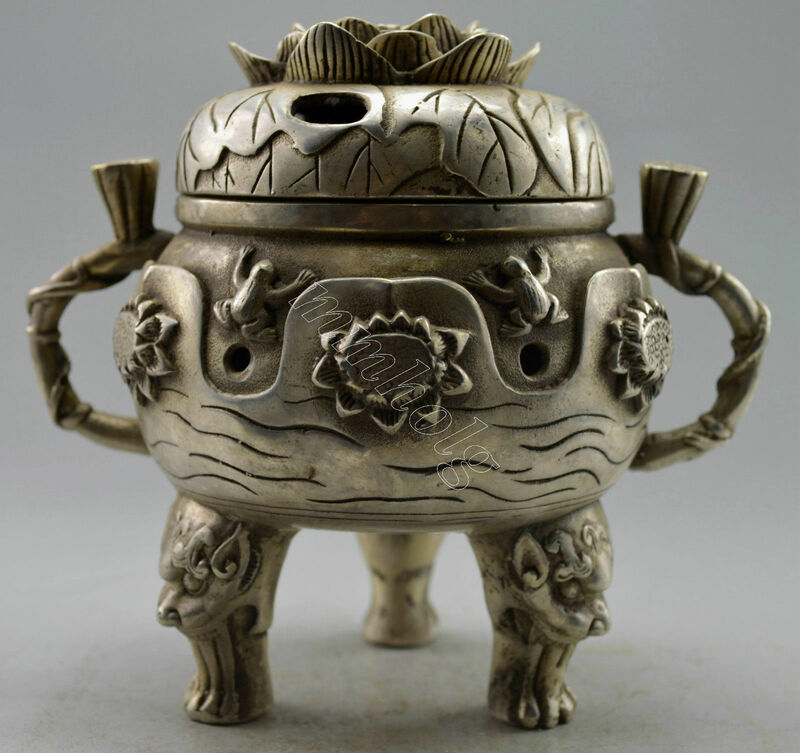 Please also see Ritual Tools of Tibetan Monks for more featured incense burners. 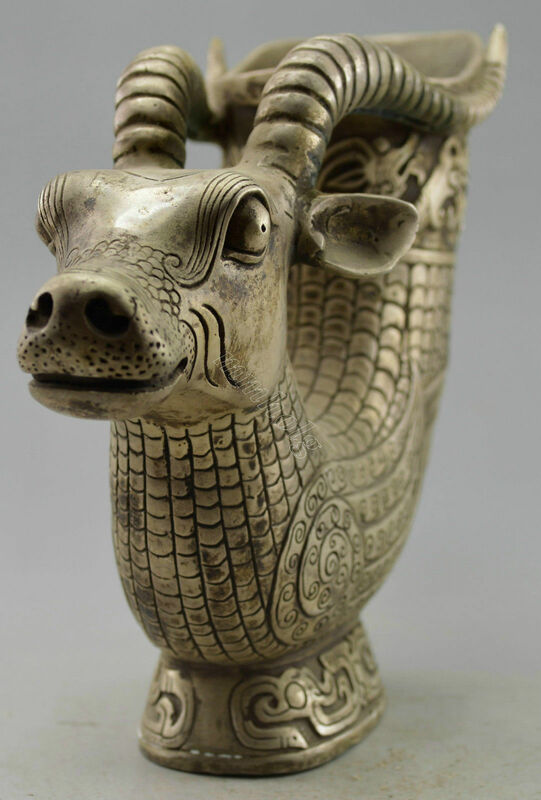 Serving ritual functions as well as being aesthetically pleasing, goat or sheep cups are also a perennial favorite- for the living and the tombs alike and seemingly have been in continuous ceremonial use longer than most cultures have existed. 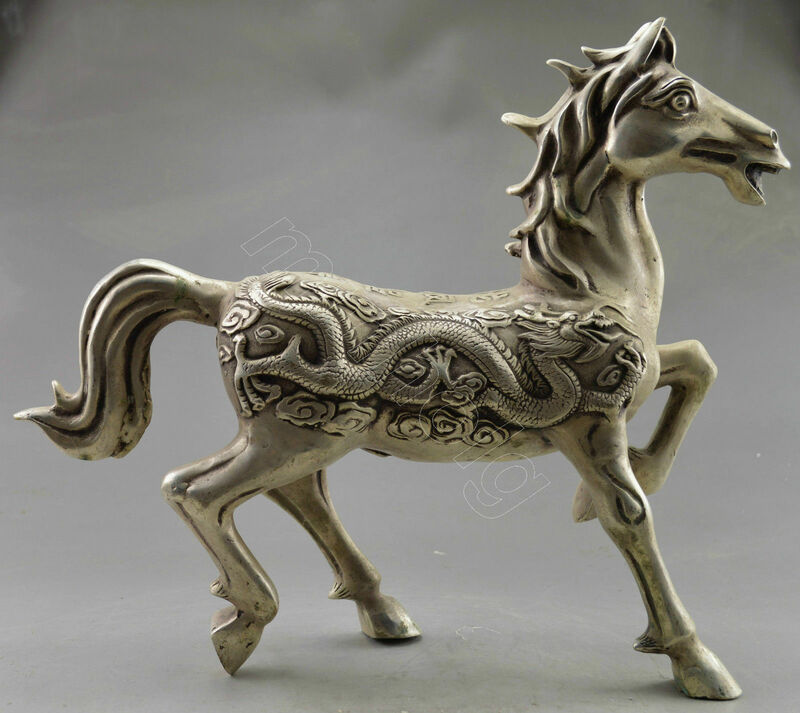 It is modeled after a horn cup made of goat horn- this type of object could indeed have been humans first cup more than 10,000 years ago- gotten from nature itself and the goat. 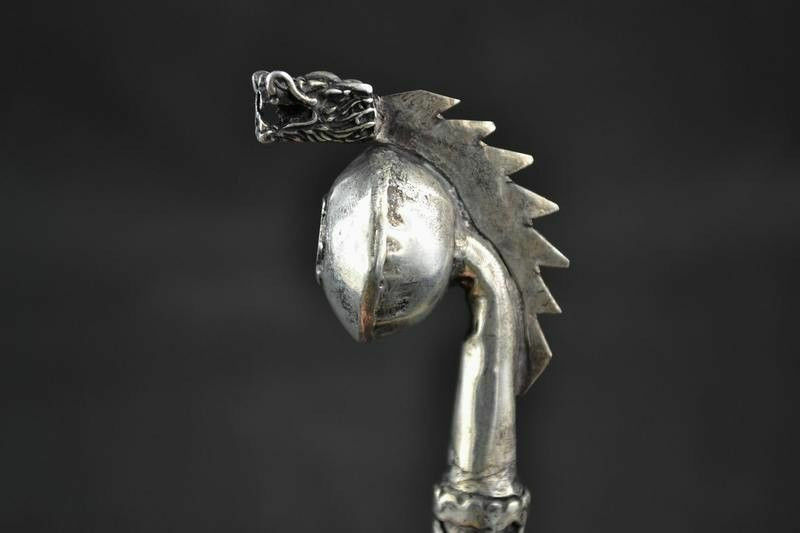 Perhaps they were only used for ceremonies, but maybe they were used like Viking cups and brought out for a good feasts as well? From proud families these came, now fallen. Sad it is to see such absolute disenfranchisement and annihilation of people. 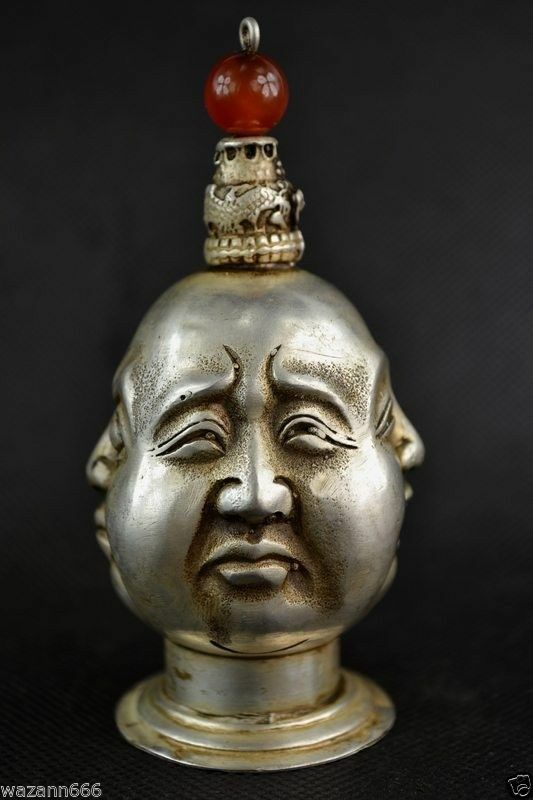 Religious shrines are also very popular, not only with Tibetans to make and purchase, but for the Chinese government to confiscate and sell. 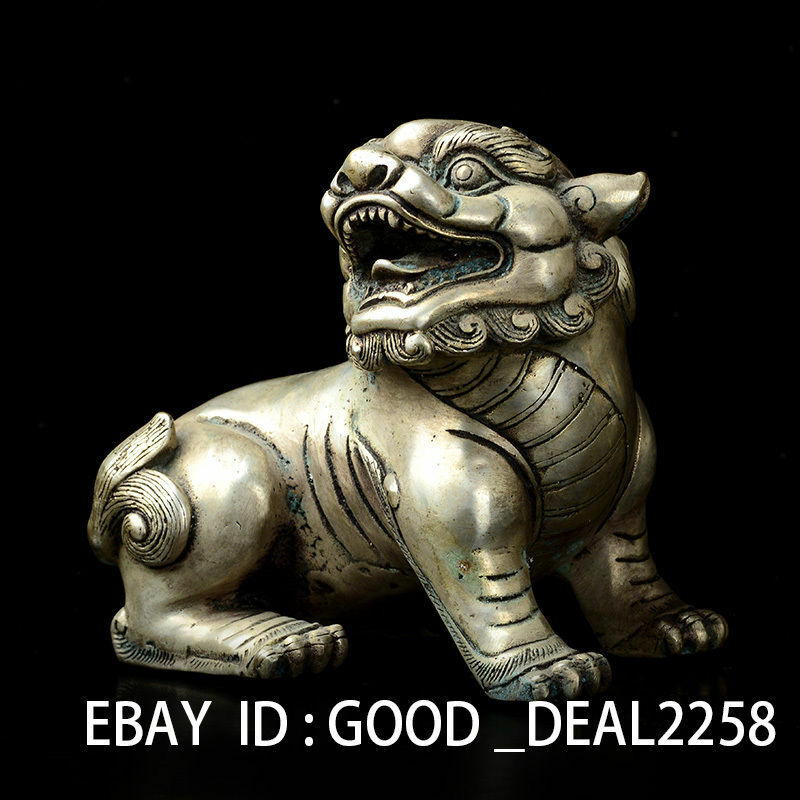 Please see The Hall of Enslaved Idols for more information on specific deities and what is being sold.